Day Use Fees at our parks range from $2–$30. Camping Fees at parks where camping is available range from $15–$50 per night. Fees are based on one vehicle per campsite. Additional vehicles are charged $15.00 per night. The extra vehicle fee does not apply to vehicles that are towed or set up to be towed behind a primary vehicle when the primary vehicle remains at the site and the towed vehicle is used for transportation, or if the second vehicle accompanying the primary vehicle is registered to the same address or the same person as the primary vehicle. Total occupancy will not exceed six adults and a total of 12 individuals per campsite. For parks with reservations, there is a $5 non-refundable reservation fee per site. Camping Cabins (where available) range from $35–$139 per night. There is a $10 non-refundable reservation fee per cabin. Annual Pass Fees range from $75–$200. Learn more about the passes, including the prices and rules by visiting our Annual Pass page. Arizona State Parks thanks the brave individuals who have proudly served our country. To support our active military members and Veterans, we offer the following discounted day use access to our parks. Discounts apply to qualified Military day use pass holder and up to three accompanied adults. Active Military, Guard and Reserve Military – 50 percent off day use entrance. Please show your Military ID at the gate, no pass is required. Arizona Resident Retired Military Veterans – 50% off day use Pass. Please bring proof of service (for example a military ID or DD214) along with your Ariz. license to a park visitor center. Disabled Military – 50 percent off day use Pass to all disabled military. Please bring your VA-Certified proof of service connected disability along with your license. Arizona Resident 100 Percent Military Disabled Veterans – 100 percent free day use pass. Please bring your VA-Certified proof of 100 percent service connected disability along with your Ariz. license to a park visitor center to receive your pass. Designated pass holder must accompany guests to receive discount. Discount is good for day entry to parks only. 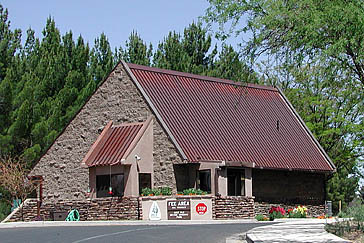 Discounts not applicable at Boyce Thompson Arboretum State Park, for tours including Kartchner Caverns State Park cave tour tickets or Riordan Mansion State Historic Park tours, special use fees, special program fees, special events fees, special event admission fees, any reservation fees, camping fees or overnight parking fees. Pass is non-transferable and photo ID is required for entrance. * Note: Ringtail Campground only open from January 1 – March 31. * Site Numbers 1, 6, 8, 10, 11, 13, 15, 16, 17, 19, 21, 23, 25 in Campground A can be reserved either as an electric or non-electric site. To reserve any of these 13 sites as non-electric you must contact the park office at (520) 628-5798. * 1/2 off for active-duty military, spouse and children. Fees may vary during special events such as Christmas Village, Lettuce Days, etc. Free entrance to Sunday's farmers market Oct. 21 – mid-May. * Reserved Cave Tour Ticket holders do not pay the Daily Entrance Fee. Learn more on the Cave Tour Information page. Note: Big Room Tours are not available for children under 7 years of age. Note: Big Room Helmet & Headlamp Tours are not available for children under 10 years of age. * 1/2 off for active-duty military, spouse and children. Fees may vary during special events such Gathering of the Gunfighters, Civil War Days, etc.